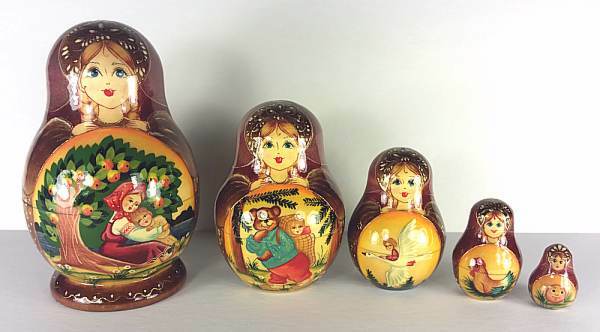 Five famous Russian fairy tales are painted on this beautiful nesting doll set. 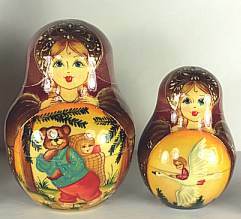 From largest doll to the smallest, they depict: 1. Sister Alyonushka and Brother Ivanushka, 2. Masha and Three Bears, 3. The Magic Swan Geese, 4. The spotted Hen, and 5. Kolobok (Dough-boy). Each doll has brown hair, blue eyes, and a slight smile. Signed by the artist.